Mind If I Order the Cheeseburger And Other Questions People Ask Vegans [Audiobook] | Free eBooks Download - EBOOKEE! What about plants? Don't animals eat other animals? There are no perfect vegans, so why bother? If you're vegan, how many times have you been asked these, and other similarly challenging, questions from non-vegans? Using humor and reason, Sherry F. Colb takes these questions at face value and also delves deeply into the motivations behind them, coming up with answers that are not only intelligent but insightful about human nature. Through examples, case studies, and clear-eyed logic, she provides arguments for everything from why veganism is compatible with the world's major religions to why vegetarianism is not enough. In the end, she shows how it is possible for vegans and non-vegans to engage in a mutually beneficial conversation without descending into counterproductive name-calling, and to work together to create a more hospitable world for human animals and non-human animals alike. 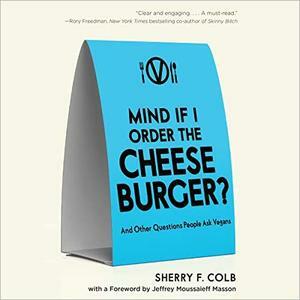 No comments for "Mind If I Order the Cheeseburger And Other Questions People Ask Vegans [Audiobook]".